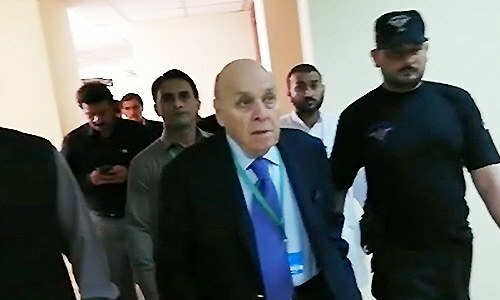 The Federal Investigation Agency (FIA) on Wednesday took former president Asif Zardari's close aide and Omni Group Chairman Anwar Majeed into custody outside the Supreme Court, where he and his family appeared today after repeated absences from hearings of a case pertaining to money laundering through fake bank accounts. Majeed and his family had been summoned to court on Aug 13 for the previous hearing of the case, but had not appeared before the three-judge bench led by Chief Justice of Pakistan Mian Saqib Nisar. 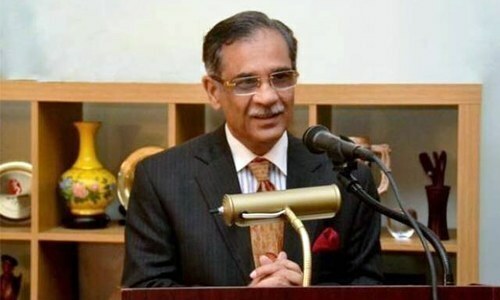 The CJP had then rejected the Majeed family's notice of absence, contemplated charging them with contempt of court, and summoned them to appear in court at the earliest. As Anwar, Nimr, Ghani, Kamal, and Zulqernain Majeed appeared before court today, the SC ordered their names be placed on the Exit Control List. The bench was told that Anwar and Ghani's names were already on the no-fly list, after which the court ordered that Nimr, Kamal and Zulqernain's names be added to the list. "If Asif Zardari, Faryal Talpur and (Bahria Town Executive Director) Zain Malik can appear before the FIA, then why not the Majeed family," the CJP commented. Justice Nisar said: "If the court wishes, the Majeed family can be taken into custody. I don't have any objections to it." Subsequently, Anwar Majeed was taken into custody outside the court. The court also discussed the matter of a fresh 'Panama-style' joint investigation team that it said would be set up to probe the case instead of the FIA JIT which Zardari and his sister earlier claimed to have reservations with. The formation of the JIT has been delayed until the court hears the lawyers' arguments in the case. In the last hearing, CJP Nisar had hinted that the JIT would not have representatives from intelligence agencies namely the Inter-Services Intelligence (ISI) and Military Intelligence (MI), as the Panamagate JIT probing the Sharif family did. Justice Nisar had said: "Maybe the members of the ISI and MI were included in the Panama Papers leaks case to spice up (Tarka) the probe," dismissing the possibility of inclusion of the intelligence agencies officials in the white-collar crime. In today's hearing, the top judge denied that the court had called for the inclusion of the MI and ISI officials in the Panamagate JIT. "We discovered that Chaudhry Nisar had included them in the JIT," he claimed. Later in the day, Nisar, the lawmaker, denied that it was him who had included the ISI and MI officers in the Panamagate joint investigation team, whose findings eventually led to former PM Nawaz Sharif's disqualification. "The JIT was formed by the three-member SC bench and to include army personnel was also their decision," the former PML-N leader said. "Neither me nor the interior ministry had any role in the JIT's formation, and we were not involved, informed or consulted in any way regarding the addition of the army officers." Meanwhile, Omni Group lawyer Shahid Hamid prayed that the court unfreeze the company's accounts, which the court denied. "The FIA will proceed with the investigation as it desires," the CJP said. vi) A seasoned Officer of Military Intelligence (MI) nominated by its Director General. How many thieves and crooks are in Pakistan? SC needs to order Zardari and Faryal Talpur to appear. FIA should arrest them. Why are they being spared? The SC should also order LHC to expedite the model town murder case against Shahbaz Sharif and his cohorts which has been and is still being delayed by the LHC. Also ask NAB why it is slowing down the cases against Shahbaz? The man should have been in the jail by now . from where did this corrupt man got so much money 10 yrs back what was in his account . he and his family is leading life like royals how. Caught by the camera he seems bewildered. Illegal dealings are as out of fashion as he is. Pakistan is cruising at a high altitude. Thanks to Saqib Nesar CJ of Pakistan and his team and all related departments for their hard work to apprehend the criminals. The noose is getting tighter, FIA and NAB are getting into Zardari's inner circles. Only a matter of time, when the head fo the gang is also behind bars. Why Anwar majeed family being asked to appear in court?? Investigate thoroughly, establish facts with evidence, identity culprits and punish them severely according to law of the county and reviver all black money - no matter who they are. This is what public expect and want to see! SC order 20 April 2017 contradicts what CJ has claimed today that Ch Nisar had included names of ISI and MI representative in JIT. SC may like to clarify this confusion. Hats off to ch Nisar for the composition of JIT. You won much heart. Cjp should avoid unnecessary commentary (for example regarding inclusing of isi and mi in The investigstion team. Isi and mi officers are not incluenced by The corrupt civilians and therefore way more Professional ). More corruption cases should be open up now, the environment is very conducive for quick justice, hope so ? And Zardari still not on Exit control list! I don't understand the last part of the news report. If the SC order included the names of ISI and MI reps in the Panama JIT, then why did the honorable CJ reportedly say that it was Chowdhry Nisar who included the ISI and MI names? Once again, great move for the restoration and reinforcement of true justice by the wonderful Chief Justice of the Supreme Court, Islamic Republic of Pakistan. Keep it up and hang on tough. Putting the likes of Nawaz and Zardari behind bars after trial isn't enough. We need all the looted money including any gains made by investment back asap. The worth of Zardari alone is over $ 1.85 billion, according to the Forbes' recent list of richest men of the world. That translates to over Rs.223 billion. Will all culprits be identified and punished? Will justice prevail without prejudice? Will all looted and black money be recovered? Will our investigative and security agencies be independent and act impartially? In Pakistan only CJP is doing his job rest of the officers are sleeping or busy in corrupt practices. Dear CJP please also do something these Patwaris, excise officers, SHOs, Tehsildars and FIA Immigration Officers. These Immigration Officers are the most corrupt. They charge millions of rupees from illegal migrants. @Fuzail Z. Ahmad I wonder also. Along with Zardari, Faryal & Shah should be investigated. @talib send in what you know and they will be. No mercy for the corrupt. They should be given exemplary punishment to deter others from doing the same. Still it is double standard. The Sharifs are behind the bars. In this New Pakistan there should be no place to hide for corrupt people especially politicians. @Farid More than we can count, unfortunately. Corruption and love for money is not limited to Politicians, it includes common people as well. The major problem in Pakistan is horrible delays to investigate, prosecute and dispense with honest judgment. Goes on for decades, new Government show up and cases are dropped. All investigation must be conducted according to our laws and under constitutional limits. Corruption has to be eradicated before progress can be achieved. @Anti-Corruption zardari not nawaz. try to get him and see reaction. Save Pakistan , too many people gave up their lives their homes , for this land we call Pakistan , it’s too precious , please save it. Hope the law moves fast against these thugs. Lets get the BIG FISH and set an example!! Investigate and ligate in public interest with same fervor and get these hereditary bad to the bone political leaders out of commission for ever. Headline should state "Alleged Fake Accounts" case. He is an accomplice in crime with Zardari, corrupt people like him are prone to breakable soon and will take no time to become a hostile witness. Chief Justice of Pakistan is doing the right job to pave Pakistan towards right direction. Sending them to jail will not do any benefit to the country... Court (CJP) must find ways to get the money back into the treasury in the shape of fines or selling the assets of these culprits. because ultimately In Jail, they will enjoy all the freedom and can easily afford and buy any person or thing as per their likings. Did anyone notice the arrogance and malicious proud on the face of the Omni Group President on TV ... how he hit the FIA agent? They FIA agent looked totally helpless against the old man. This is the true picture of real equality scenario in Pakistan that how these seaths behave with the general public and even with the law agencies. @Farid It will be easier to count the honest ones.